I ran into a little bit of an issue over the past several days…my battery life was horrendous. Or at least it seemed that way compared to what it was under Windows. Linus is notorious for having worse battery life (one of the few downsides to running it) on laptops, and the best explanation that I’ve been able to find is that the kernel is made to support such a wide variety of hardware, that it may be supporting things that you don’t need. I remembered vaguely doing something about this during my last install, but it had been a while, so I had to research again to figure out what to do. There’s a really simple tip that will help greatly – my battery life (as measured in Gnome) went from a little under 3 hours to almost 7. Not quite the 9 hours I had under Windows, but a huge improvement nonetheless. Install two utilities – tlp and powertop. This is neat, it shows you what is using the most power. You can do some Googling if you want to learn about changing the settings – but after seeing how much tlp helped my battery life (more below) I didn’t deem it necessary. 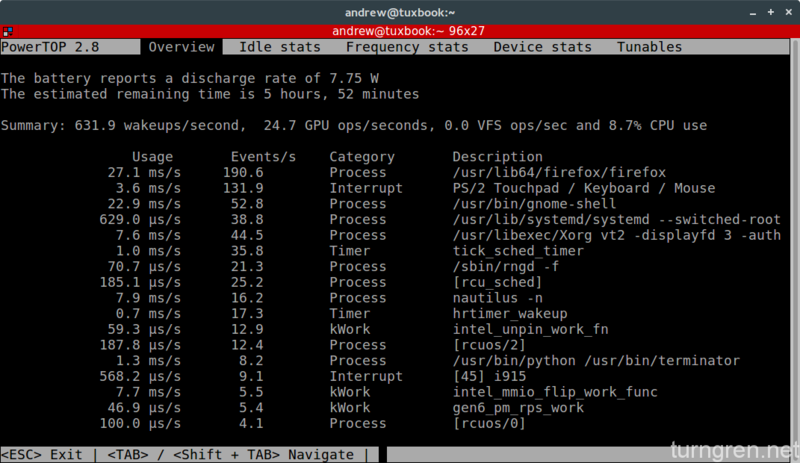 Wait a few minutes for it to work its magic – then look at your battery life in Gnome. It should be greatly improved. Tlp isn’t specific to Thinkpads. This could help with other laptops – but from what I’ve read, it’s especially effective on Thinkpads. For me, it gave me a marked increase. You can do other, simple things to extend your battery life…things like disabling Bluetooth when you’re not using it, or Wifi (although if I’m using my laptop I’m almost always using Wifi). You can also reduce your screen brightness to extend battery life. That one seems like a no-brainer, but is forgotten easily. There are also come kernel parameters that you can mess with, but I didn’t think it was worth the time afer installuing tlp. If you have any other hints and tips, comment below and I’ll be glad to research them a little bit. Next Next post: Fedora 24 Is Out!